"I almost laugh. Almost. I don't even know how to think for myself. I realize I've only been the negative space in Leah's life this whole time." Devastated by her older sister Leah's suicide, Allie hunts for the reasons why. Especially since the two had a pact to always be together, in life and in death. In her struggle to find out why Leah killed herself, Allie's not sure which is more distressing: finding out the secrets behind her sister's death, or learning to live without her. I'm on the fence about this book. While I loved that it didn't pull any punches when dealing with the grittier, harsher sides of life, I'm pretty sure my own history with mental illness and younger sister caused the subject matter to hit me a bit harder than was intended. I liked Allie as a narrator, even though she was often unreliable as she dealt with her growing drug addiction, and the frequent visitations of her sister's 'ghost'. She was real, and I appreciated how Ramey gave her that realness. Allie was a fantastic portrayal of someone grieving over the loss of someone close, someone who she considered to be her other half. Leah, on the other hand, I had a love/hate relationship with. Mostly I think that was because of how similar to me she felt. She was the older sister, who wanted to seem perfect to her younger sister, but at the same time was struggling with both severe depression and drug addiction. I loved that she was just as real feeling as her sister Allie; however, by that same page, I hated her. In regards to Allie's relationships/friendships, holy toxic 101 readers. None of the people Allie had a relationship with was anything I'd consider healthy. Even her best friend was someone I wouldn't want in my life. 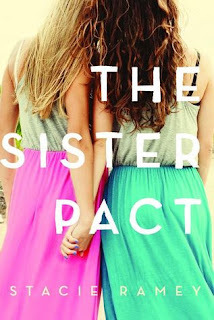 Likes and dislikes aside, this book made me super thankful for my own sister, and the relationships I have. And, I'm eager to see what Ramey writes next.